The story was posted on Friday 9th November just making it the fastest AFT story from concept to screen (see SHOOTING below). Its cover art and this behind the scenes page was not added until Monday 12th April. Thanks to CO rushing through the release of the 11th Doctor figure to coincide with his TV debut, the AFT has been able to keep up it's tradition of debuting new Doctors as they appear on screen. When the tenth Doctor appeared in The Christmas Invasion in 2005, the AFT followed suit with The Doctor vs Alien a week later. The ninth Doctor did better, appearing in The Unearthed Enemy immediately after the transmission of Rose in March 2005. When we knew we were getting a new Doctor figure but not an Amy, I wasn’t too fussed. It’s not beyond the realms of possibility that the Doctor could nip off and have a trip on his own at some point during the series so I began to come up with ideas for an adventure. Sure enough, the end of The Eleventh Hour gave me the exact opportunity to put in my story.- albeit a trip to the moon. That gave me the setting for my story. With my Moffatt head on, I began to consider- what would be the least likely thing to find on the moon...? I wanted to pit the new Doctor against an old enemy from the Russell T Davies era that he more than likely will never face again. Since, the Slitheen were the first new recurring race of the new series, they were the obvious first choice. I considered other races, even considered having them change along with the whims of their chance engine but decided the Slitheen were best suited. The Chance Engine is based on the Improbability Drive from The Hitchiker’s Guide To The Galaxy. 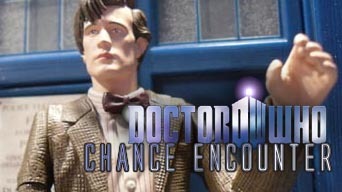 With the storyline written on 5th April 2010 and scripted on the 6th, it immediately went into production on the 6th. For speed, it uses stock sets- Sarah Jane's living room from The Year That Never Was dressed with furniture from Mickey's flat and Sarah Jane's attic. The consoles of the Slitheen ship were used in Ood In Space. 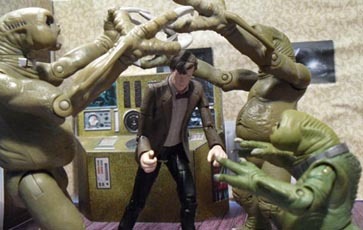 The original storyline specified a mum, dad and child to match the Slitheen figures. But in the absence of a decent child figure, the kid became Grandma Connolly. Editing took place on 8th and 9th April 2010 with a number of photoshop jobs to be done including creating the interior of the TARDIS using stills from the Radio Times and BBC online's tour of the new TARDIS. Photoshop was also used to upgrade the 10th Doctor's flight control TARDIS to the new model with white window frames and St John's ambulance sticker. The Doctor's deck of cards were also supplied by photoshop. 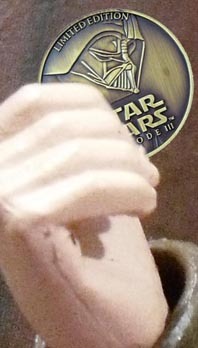 The Doctor's 2 sided coin is actually a Star Wars Celebration commemorative coin. 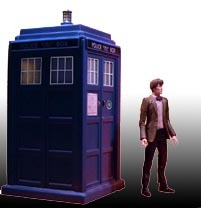 As stated above, this mini adventure takes place in the closing minutes of The Eleventh Hour as the Doctor takes his newly rejuvenated TARDIS to the moon for a test drive. 've taken some scientific liberties with the Doctor landing on the moon but it seems Amy can float outside the TARDIS and River Song can jump out of an airlock without any adverse affects in this new series. Whoever said that Doctor Who had to be scientifically accurate? If anyone really wants to know how he did it, I'll explain later.